O.apifera was first described by Hudson from England as far back as 1762. 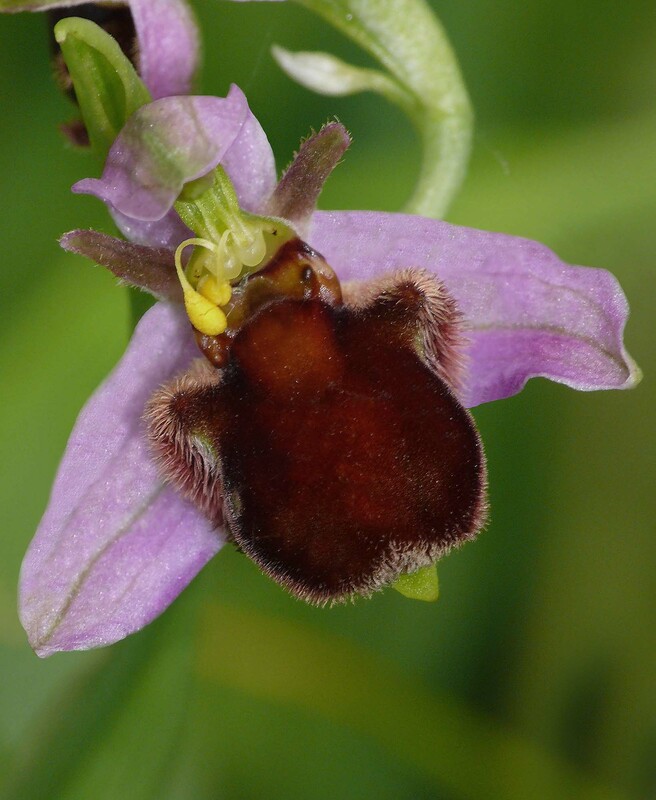 Its name refers to the flowers resemblance to a bee and accordingly the species has long been commonly (and not a little affectionately) known as the Bee Orchid. It's a widespread orchid with a distribution across temperate and Mediterranean Europe as far east as the Caucasus. In its favoured locations it can be abundant and its choice of habitat is wide, ranging from the driest chalk grassland and garrigue to wet even swampy conditions. It predominently favours full sun positions but will tolerate (though not relish) even significant shade. O.apifera is largely self-pollinating and this autogamy seems responsible for the frequent appearance of variant plants, some of which, although not of evolutionary significance occur on a sufficiently regular basis to have aquired formal varietal status. O. apifera v fulvofusca is an uncommon variety found throughout the range of O. apifera but has been rarely recorded in the UK. The lip has completely lost its specular markings and appears as a uniform brown though as can be seen from the photograph, the basal field is still vaguely visible as a lighter shade of brown. The photograph was taken in Weymouth, Dorset, UK and dates from the end of June.